What's ambience when there's good food? Je Ngor's kitchen may seem like a normal hole-in-the-wall shop house on the outside, but it's all succulent abalone and steamed crab on the inside. This place is all about providing good Chinese seafood. Try the 5 Special Hors d' Oeuvres, Tom Yam Goong, Fried Oysters, and Stir-fried Morning Glory. This is the first of many branches which have opened throughout Bangkok (some in fancy shopping malls) but when you want the real deal, you'll need to head down to old town. Take a taxi from Saphan Taksin BTS Station to Charoenkrung rd. 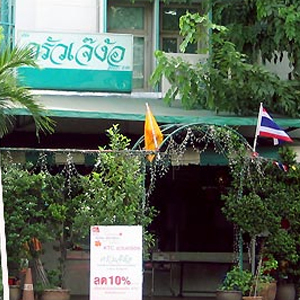 at the corner of Soi 39 is Je Ngor's Kitchen.